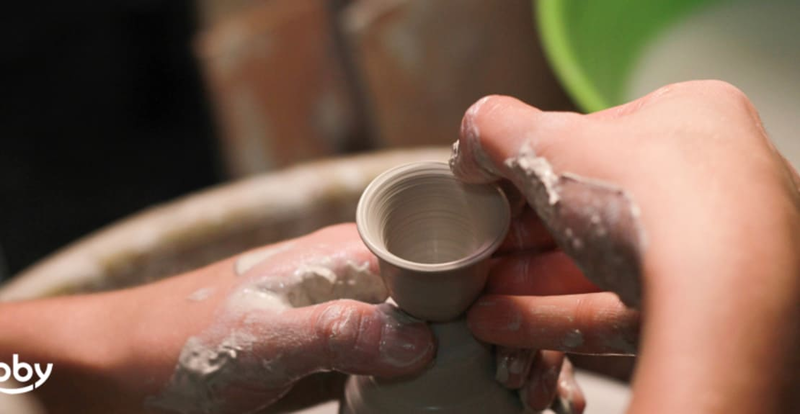 In our pottery classes, you either use a pottery wheel or your hands to shape the clay. The pottery wheel, however, is the most common conception when it comes to the art of pottery. We take a deeper look at the pottery wheel, how it came about and where you can get your hands on trying it out. What is the Pottery Wheel? The potter's wheel is believed to have originated from the early technique of coiling. Coiling is the technique of rolling the clay into long strips and then stacking them and winding them around on top of one another to create cylinder objects. There is evidence that early potters would use large leaves or wooden slabs to place there work on when using the coiling technique to build ceramics. We know they did this from the indents on the bottom of early ceramics at the bottom of the pot. It's assumed that this was so the potter could spin the slab or the leaf to get to other parts of their work, making the process of coiling easier for them. It's then thought that this is where the original idea for the pottery wheel came about. The earliest forms of pottery wheels called the tournettes or slow wheels were operated and turned slowly using the foot or hand. The advancement on this came about in what is thought to be the mid to late 3rd millennium BC. The fast wheel used the flywheel principle and utilised the energy stored in the rotating mass of the heavy stone to create a fast spinning wheel for potters to work on. With the invention of the fast wheel, a new form of pottery making was invented. Throwing is the pottery we think of as being the norm today. The fast rotating wheels can be used to help potters create ceramics on a larger mass scale. In this day we now have electric pottery wheels which are controlled by a foot press and a motor which spins the wheel for the potter to work on. This way, the potter can alter the pressure used on the foot press to alter the speed of their wheel, meaning they can work a lot more efficiently. Once you have the initial skill mastered you have to practice often. You can create some incredible things with the help of the pottery wheel and some water, but the experts do make it look easy. Luckily, for those of us looking to start pottery for the first time, and satisfy our need to learn more about how the pottery wheel works, there are classes you can attend to learn how. Here are some of the best classes for beginners and the likes to try out the pottery wheel and get to know it on a little more of a personal level! This is a one-day introductory pottery class), where you will learn the very basics of throwing on the potter's wheel. This will include weighing and preparing balls of clay before you start, then the basics of the wheel - from centering your clay, pulling, shaping and working with your tools, beginning to learn the techniques of throwing bowls and cylinders. It's a challenging process, but this pottery workshop only takes three people, so you get close tuition from a very experienced teacher. Perfect for complete beginners to pick it up and have a go or for anyone wanting a little more practice or help with a new technique.